34 F A ll 2018 Practice l ink.com ▼ T HE C O n T r AC T S & C OMPE n SAT IO n ISSUE D E P A R T M E N T S Legal Matters sara H Y ates re DDY, es Q. 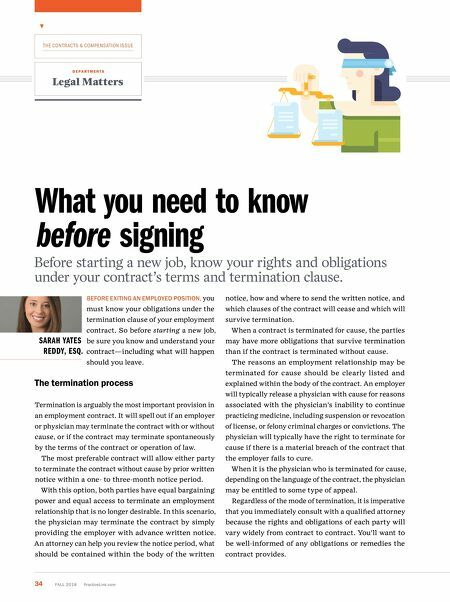 What you need to know before signing Before starting a new job, know your rights and obligations under your contract's terms and termination clause. B e F ore e X itin G an emp L o Y e D position , you must know your obligations under the termination clause of your employment contract. So before starting a new job, be sure you know and understand your contract— including what will happen should you leave. The termination process Termination is arguably the most important provision in an employment contract. It will spell out if an employer or physician may terminate the contract with or without cause, or if the contract may terminate spontaneously by the terms of the contract or operation of law. The most preferable contract will allow either party to terminate the contract without cause by prior written notice within a one- to three-month notice period. With this option, both parties have equal bargaining power and equal access to terminate an employment relationship that is no longer desirable. 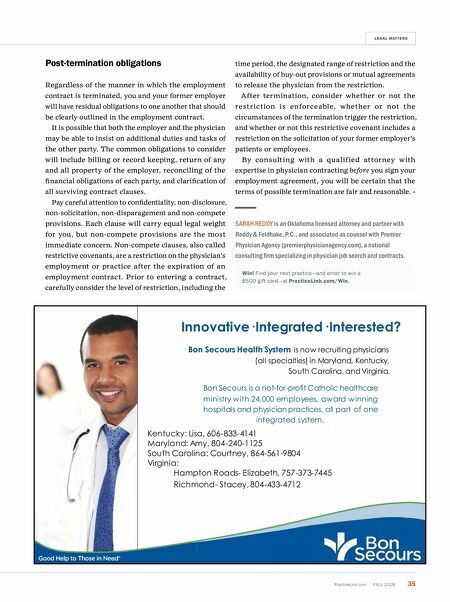 In this scenario, the physician may terminate the contract by simply providing the employer with advance written notice. An attorney can help you review the notice period, what should be contained within the body of the written notice, how and where to send the written notice, and which clauses of the contract will cease and which will survive termination. When a contract is terminated for cause, the parties may have more obligations that survive termination than if the contract is terminated without cause. The reasons an employment relationship may be terminated for cause should be clearly listed and explained within the body of the contract. An employer will typically release a physician with cause for reasons associated with the physician's inability to continue practicing medicine, including suspension or revocation of license, or felony criminal charges or convictions. The physician will typically have the right to terminate for cause if there is a material breach of the contract that the employer fails to cure. When it is the physician who is terminated for cause, depending on the language of the contract, the physician may be entitled to some type of appeal. Regardless of the mode of termination, it is imperative that you immediately consult with a qualified attorney because the rights and obligations of each party will vary widely from contract to contract. You'll want to be well-informed of any obligations or remedies the contract provides.